"We can't allow things that are inaccurate to stand." — The Word of Our Dan, February 19, 2008. The province’s chief medical examiner said the number of homicides here is on the rise. There were 70 homicides in the province between 1997 and 2009. And that is about all the phrase “70 homicides in the province between 1997 and 2009” can tell you. It says absolutely nothing about whether the number or rate of homicides are increasing, decreasing, or stable. So, what is actually going on? First, despite the widespread popular belief to the contrary, the homicide rate in Canada has been on a relatively steady downward trend since the peak of around 3 per 100,000 was reached in the mid-1970s. 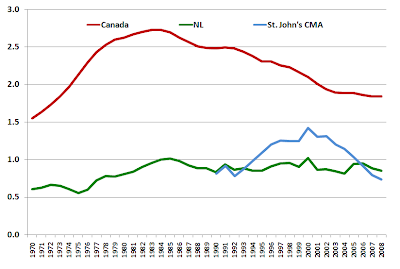 Second, with the exception of a few outlying years, the homicide rate in the province and in the St. John’s metro area is consistently at, or much below, the all-Canada figures. 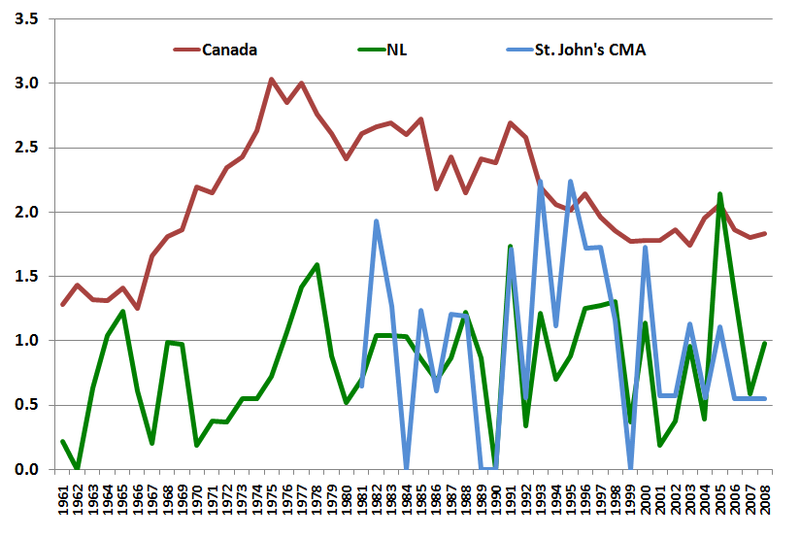 Third, while there are some years in which the homicide rate in the province or in St. John’s spike upwards, there is no pattern to the spikes. “Spike” years are followed, thankfully, by “crash” years, such as 1999 and 2004 when there were just two homicides reported in the province, 2001 (just one), or 1990 (none). 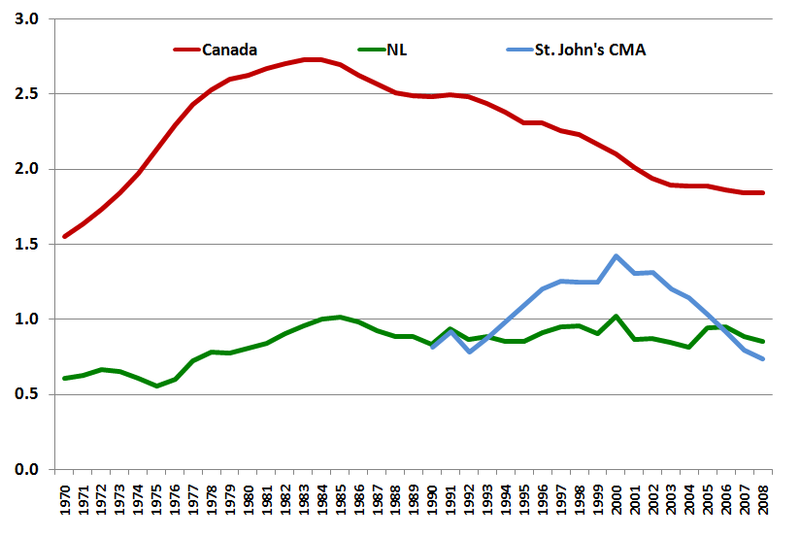 While there was a long-term increase in the homicide rate in St. John’s through the 1990s, that trend reversed itself a decade ago, to the point where the long-term figure for St. John’s recently dipped below the provincial rate. And the provincial rate is stable. There is absolutely no support to be found in the official crime statistics for the assertion that homicide is on the rise in Canada, in Newfoundland and Labrador, or in St. John’s. It’s a good thing though, that innumeracy isn’t a Criminal Code offence. Part of the problem with the story is that Avis compared an eight year period with a 12 or 13 year period and then went "A-ha!". Macleod just ran with what he had. The problem is with Simon's characterisation. 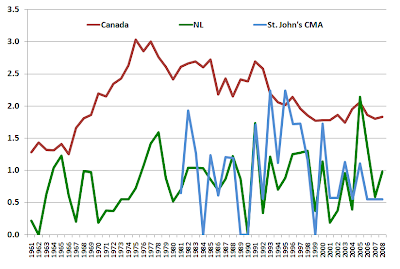 However, as you noted, part of the period he selected includes that uptick period in St. John's and didn't really look at the patterns or actual trends. Even if you look at absolute numbers - as opposed to number of homicides per 100K population, there is still not something to get alarmed about. And the claim about two serial killers? Without much more evidence and a discussion of the specific cases, Avis appears to be was irresponsibly sensationalising.